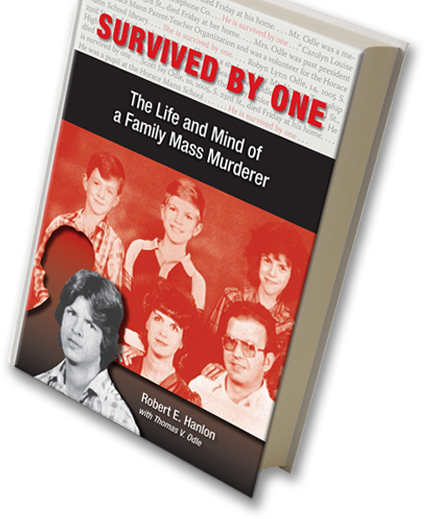 On November 8, 1985, 18-year-old Thomas Odle brutally murdered his parents and three siblings in the southern Illinois town of Mount Vernon, sending shockwaves throughout the nation. The murder of the Odle family remains one of the most horrific family mass murders in U.S. history. Odle confessed to the grisly crimes, was sentenced to death, and expected a lethal injection to end his life. It seemed to be a sad end to a rare case of parricidal familicide. The collective human response to a teenager murdering his entire family is, “How does something like this happen?” When the murderer himself, after years of incarceration and self-reflection, asks the same question, we are compelled to join him on a journey deep into the circumstances and dynamics that may explain, but not defend, this unforgivable act. Written in part by the killer himself, this book offers a first-hand account of the thoughts and experiences that led to his appalling crime. In a truly unique collaboration, this convicted mass murderer, Thomas V. Odle, and neuropsychologist Dr. Robert Hanlon, tell this tragic story of abuse, abandonment, annihilation, and atonement. At the age of 19, Tom Odle was the youngest death-row inmate in the Illinois prison system. Viewed as a remorseless, coldblooded killer, devoid of normal emotions, Odle spent 17 years waiting to die. However, a moratorium on executions in January, 2000, followed by the commutation of all death sentences to life sentences in 2003 changed Odle’s destiny from certain death to natural life in prison without the possibility of parole. After living in denial about his family and horrible crime for years, Tom Odle suddenly found himself confronted with an unfamiliar reality: a future. As a result, he began his search for answers by reaching out to Dr. Robert Hanlon, a neuropsychologist who had previously examined him. Over the next few years, Hanlon engaged Odle in a therapeutic process of introspection and self-reflection which became the basis of this book. Can society learn something from reviewing the factors underlying this shocking crime in order to help prevent future cases of family mass murder? Although attempting to understand a crime does not mean forgiveness, Dr. Hanlon offers invaluable insights into the mind of the individual responsible for one of the most notorious domestic homicides in American history. Survived By One tells the fascinating story of Thomas V. Odle, who was still a teenager in 1985 when he murdered all of his close family members – his parents, two brothers, and his sister. Dr. Hanlon, the author of the book and forensic neuropsychologist, traces young Tom’s life from his childhood to his teens, and then from his arrest through to his prison sentence. Odle had been on Death Row in Illinois, but this was eventually changed to life in prison after a series of landmark court cases. While in prison, Odle reached out to Dr. Hanlon to help put his life in perspective. With Odle’s assistance and permission, Hanlon has expertly put together this life story of a killer. Apart from being very accessible, one of the best things about this book is how Odle’s story is told. Hanlon describes the life of Odle, which includes his expert psychological analysis of events in Tom’s life, as well as the historical and legal context of the story, and splices in Odle’s own personal narratives. This allows the reader to build up a rich idea of how Tom’s mind and life perspective developed throughout his childhood. For those seeking to understand how a person could commit familicide, Hanlon’s telling of the story is genius. Continue reading this review.